As Finn has got bigger and more capable of walking, we have started being able to explore sometimes without a buggy. We can never manage long and we don't do it often, but being out without a pushchair feels so wonderful and free. The three boys can explore and we are free to follow them without worrying about going off the beaten track, and Cora can cuddle up close and watch the world from my level. She has always loved being in a sling or carrier as she gets the reassurance from me as we walk. She loves being cuddled up and being able to watch the world go by, and she sleeps soundly with my familiar heartbeat in her ear, my warmth against her. 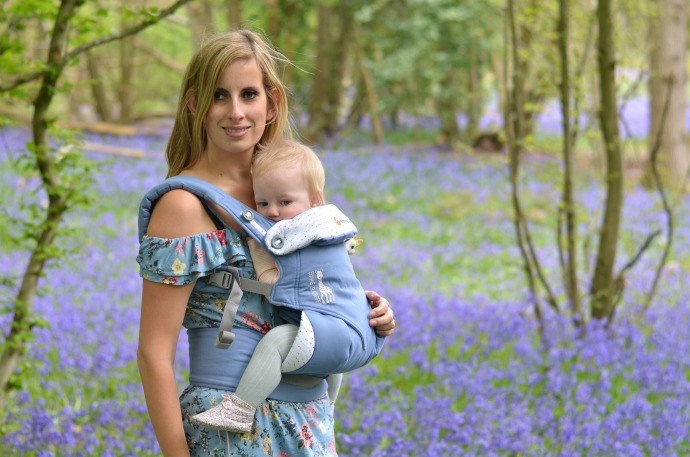 The Ergo 360 is a wonderfully designed sling that adapts to the baby with the adjustable sides and head support. I have the neck support folded down for Cora as she is still quite petite but as she gets bigger I will fold it up using the higher buttons to give her more support as we walk. Tucked inside it is a hood which is perfect for when she snoozes as it keeps her head supported and is lovely and breathable. One thing that really stood out for me with the Ergo 360 was the waistband. It is thick and really secure with strong velcro and then a seperate clip over the top. Even without the clip, the velcro feels secure enough and the thick band means it doesn't dig in like some others. The lumbar support is great and my 19lb baby feels very light. I love the design of this, it is a beautiful blue and the inside is covered in a delicate bunting print. The carrier has a Sophie Girafe on the side as well as a seperate toy loop perfectly designed to hold the iconic teething toy (we have attached ours already for Cora to chew on). Cora is a petite 9 month old and this carrier feels a perfect fit for her. I don't know how long it will fit her legs knee to knee for, but currently she has the perfect seat with her knees a little higher than her bottom. The Ergo 360 works in 4 positions so as well as the classic front carry, you can also carry a baby facing forward and the leg support adapts via hidden buttons to ensure the child is still supported in a seat like position. As Cora gets bigger I can wear her on my back too, and I have already tried it out around the house this way and found it really comfy. You can also use a hip carry which we still haven't tried, but it looks simple so I will give it a go and update the post. For newborns, there is an insert cushion you can buy to keep their legs in the optimal position. I am really enjoying using the Ergo 360 Sophie la Girafe carrier for Cora. I find it really comfortable and I love the classic blue colour and the print. It feels secure and well padded and she seems content and happy when she is in there. 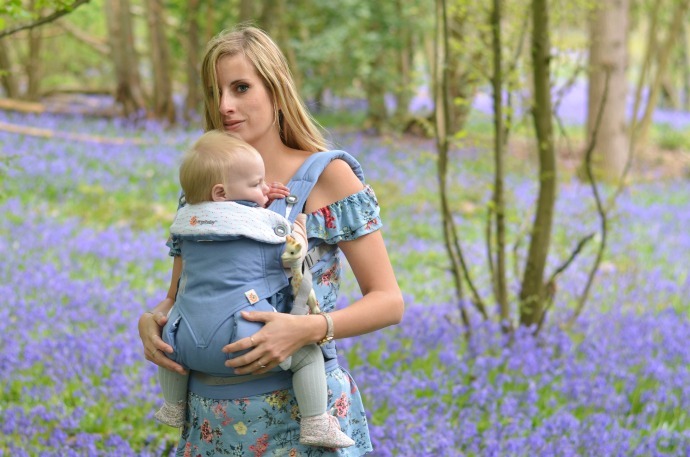 The adjustments are all easy to make and this carrier is so flexible with the different carrying positions that it suits most parents. The carrier can be used from birth/7lb (with a newborn insert) until 33lb (roughly age 3 to 4).